Recently, The Guardian published some remarkable photographs by two young French photographers, Yves Marchand and Romain Meffre taken from their new book, The Ruins of Detroit (www.guardian.co.uk/artanddesign/2011/jan/02/detroit-ruins-marchand-meffre-photographs-ohagan?intcmp=239). Discovering images of the abandoned Michigan Central Railway online, they embarked on a spontaneous project involving several trips to Detroit over five years. What they have captured is a tragic collapse of civic life in the heart of one of America’s greatest industrial cities. For anyone with an attachment to American history, design or culture, these images starkly illustrate pervasive decline in Detroit, which seems to characterise an irreversible loss of America’s legendary economic power and accompanying confidence. Once a majestic terminus and the tallest station in the world, Michigan Central Station constructed in the architectural language of Ancient Rome, now stands as an empty shell, stripped of purpose and dignity. What ought to be a landmark building and an exemplar of civic pride, is now an architectural ruin, a memorial to an age within living memory of America’s immense industrial ingenuity and productivity. Motown’s world beating automobile industry which pioneered mass production in the 1920s and in the 1950s made cars that became the ultimate embodiment of post-war aspiration, are now on their knees fighting off competition from newly emerging economies. But with the wilting of demand for American-made cars is an accompanying faltering of an entire city. The Vanity Ballroom, built in 1929, where Duke Ellington, Tommy Dorsey and Benny Goodman once played is also a husk. Only the wonderful Art Deco chandeliers, still hanging from the scarred ceilings illustrate how seductive this Aztec-styled pleasure palace was for up to a 1000 dancing couples. This is the type of room influenced by hundreds of Hollywood sets built firstly for the silent screen and then the early days of sound during what we continue to call the ‘Jazz Age’ . There’s something inevitably melancholic about seeing great buildings decay before our eyes. 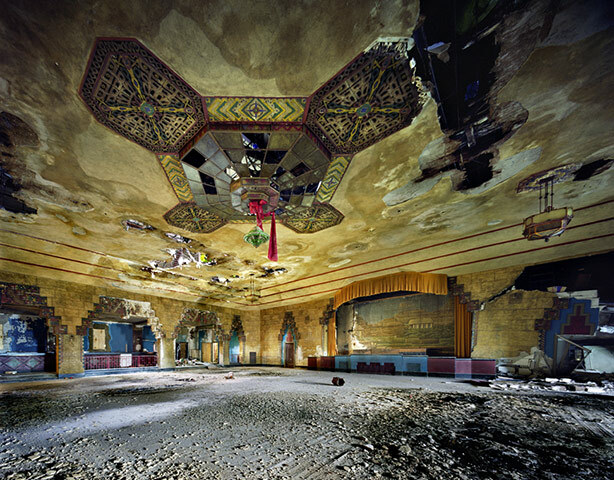 It’s too close to the bone perhaps, reminiscent of mortality and the entropic collapse of fantasy and entertainment embodied within extraordinary buildings. Detroit’s historic place at the heart of the industrial Mid-West made it a popular destination for the great migration of African-Americans heading north from the rural south in the early 20th century. This huge demographic dislocation largely produced a distinct musical culture in the city, which came of age during the 1960s with the emergence of the Motown sound. Another website I found called Detroiturbex.com compiles even more extensive photographic archives documenting the social collapse of Detroit produced in a less glossy style than Marchand and Meffre but neverless as painfully haunting. Numerous schools, apartment buildings, churches, libararies, hotels and clubs stand empty and disintegrating. This blogger explains that Detroit lost a million inhabitants between 1950 and 2010 as if the energy of the city just seeped away. To see the structures that housed an entire society with all its aspirations simply abandoned is to experience some of the trauma of walking through Pompeii in the Bay of Naples. At White Cube in the West End, Gregory Crewdson is exhibiting a new series of photographs employing a similar theme of decay and the irrepressible march of time. Instead of staging his now familiar theatrical mise-en-scene of suburban fantasies in lush technicolour, Crewdson has opted for the subdued subtlety of black and white prints. 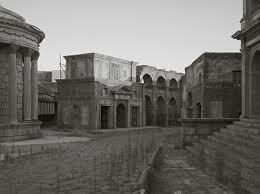 Furthermore, he now opts to take images on the outdoor sets at Cinecitta, Rome’s dream factory. These images austerely record the strange ambiguity of sets built to resemble either Roman cities or historical periods such as the 19th century. What may appear to be accurate reconstructions are persistently subverted by Crewdson’s exposure of scaffolding, ropes and props designed to facilitate a fantasy in the movie theatre. So the viewer is invited to participate in a simulacra of history while simultaneously being encouraged to appreciate the elaborate pretence that defines the entire process of film-making. Titled ‘Sanctuary’, the series aptly demonstrates the artifice of film itself. On the one hand the sets are painstaking re-enactments down to the intricate details of brickwork, friezes and sculpture but on the other we witness the sheer flimsiness of these constructions shedding plaster and wood before our eyes as they sit devoid of activity. Entirely two dimensional and propped up at the rear, the sets are flimsy two-dimensional facades allowing the camera to skim across the surface but not to penetrate any deeper. Of the 41 prints, only one illustrates any human presence. Hung on it’s own in a side room, this last photograph shows a female gate keeper at the entrance to the studio, oddly resembling one of those ticket sellers from the 1930s who used to sit outside the elaborately themed cinemas. Crewdson seems to link the process of film making to the history of its distribution in an era when film-making on the grand scale of Cleopatra and other movies made on this lot in Rome are being superseded by new technologies and audiences. So this elegiac, nostalgic quality is present in both the Detroit and Cinecitta series. Photography is a superlative medium for evoking a profound sense of loss, of time washing irretrievably over buildings and places like a corrosive high tide. But we can enjoy the immense layering of information that both photographic practices achieve. We could spend hours isolating elusive and obscure details that appear to be literally fading before us. Crewdson successfully captures that uncanny, mysterious quality of ‘make-believe’ intrinsic to film. Ironically these sets are built close to the authentic historic site of the Roman Forum. But only a set will suffice because it can be manipulated in a hyper-real fashion. While across the Atlantic twentieth century ersatz derivations of Roman architecture already lie in ruins little more than a 100 years after they were constructed.